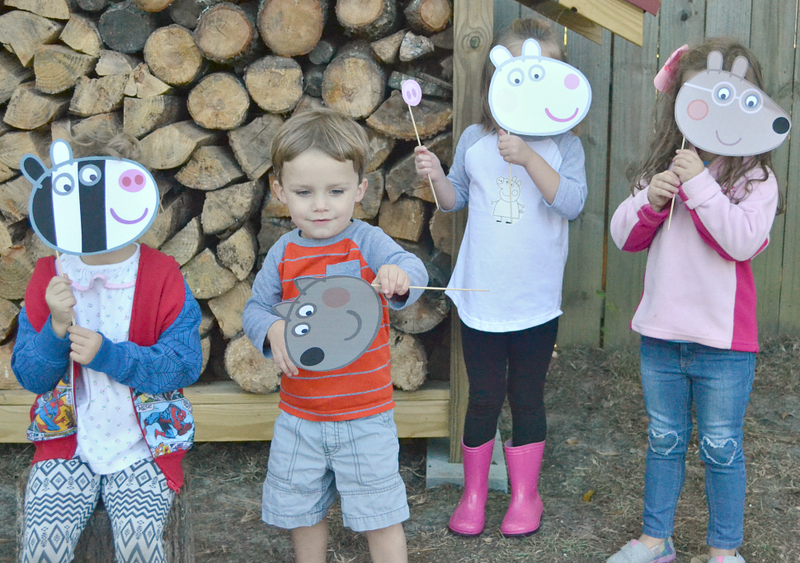 Fawn Over Baby: A Peppa Pig Themed Backyard Birthday Picnic - McKenzie Turns 4!! 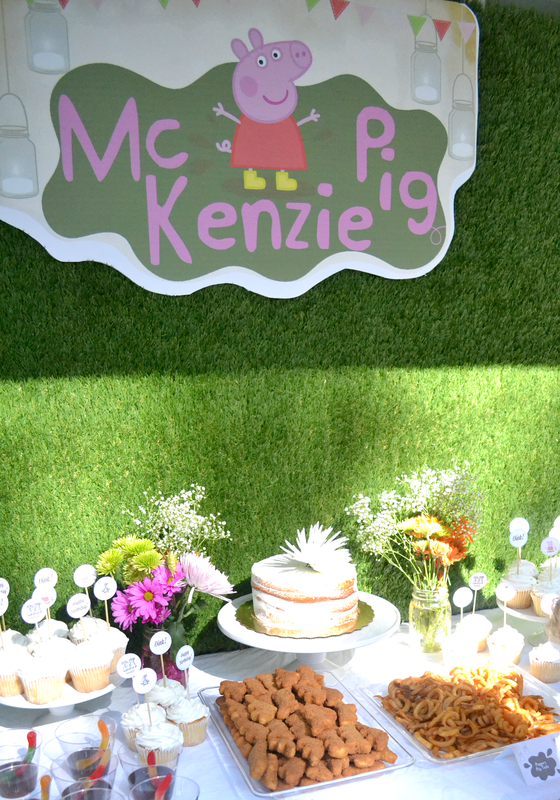 A Peppa Pig Themed Backyard Birthday Picnic - McKenzie Turns 4!! Hi Friends!! So we had another bitter/sweet milestone celebration this past weekend! My little McKenzie turned 4! I can't believe that she is already four years old. When I became pregnant with her is when I considered starting a blog. 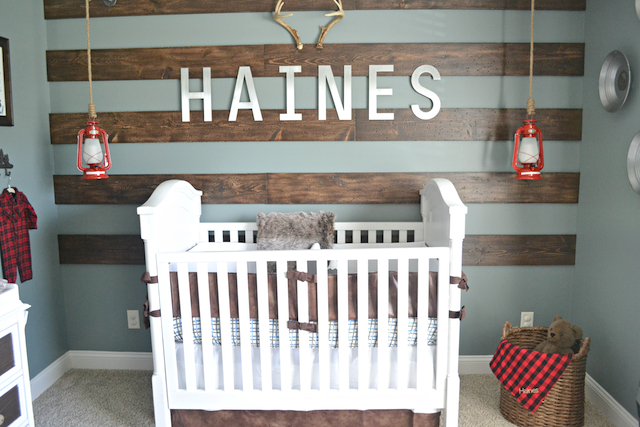 Almost immediately after she was born, Fawn Over Baby was born! It's hard to believe that was four years ago?! I tell ya, the time just sneaks up on you when you are raising little ones! It's funny how much McKenzie's likes and dislike have changed. When she was a baby, the only station that she would sit still and watch was Baby First TV, then we moved on Disney Jr. and the second she turned three Nick Jr. was where it was at! I let her stay up late one night and she happened to catch an episode of Peppa Pig. Let's just say she was a huge fan immediately and I've had to add Peppa to our DVR line up! 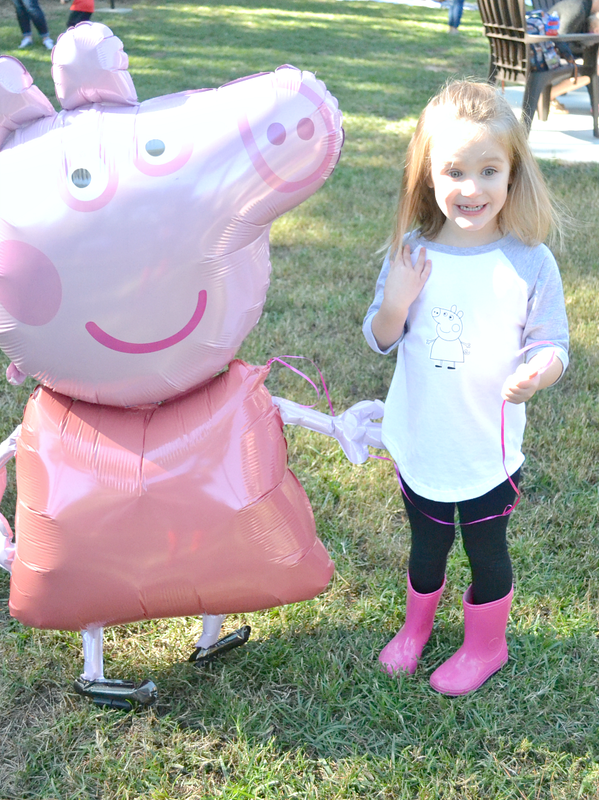 When her birthday roll around, it wasn't a surprise that Peppa had to be apart of her big birthday celebration! 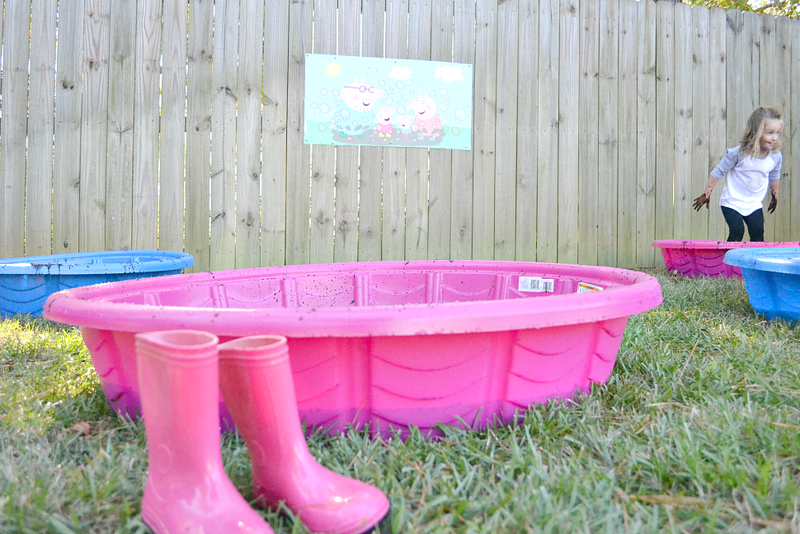 So off to Pinterest I went and the search for Peppa Decor began! If you have seen past party designs that I've put together, you know that I haven't had much experience with "Character" themes. To be honest, they intimidate me. With so many colors & decor options out there, I start to feel overwhelmed the minute I hit "search". 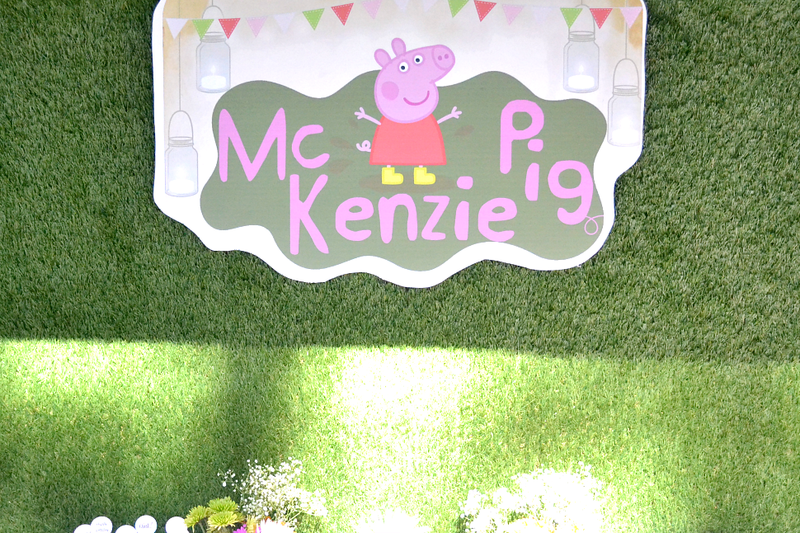 So for McKenzie's birthday, I sort of honed in the whimsy a little and came up with an outdoor kid-friendly theme first - then sprinkled some Peppa in the mix. 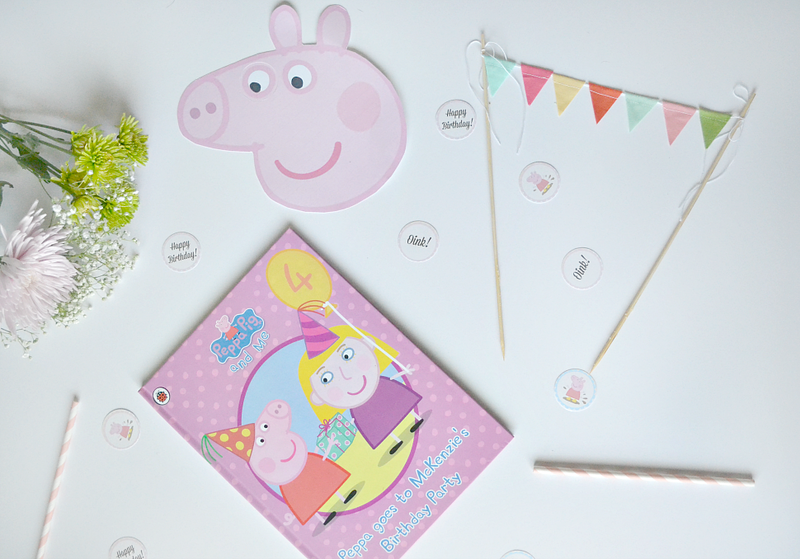 Believe me when I say that Peppa can be printed on just about anything and if you're not careful you could have a "Peppa" (or any character for that matter ) Explosion! 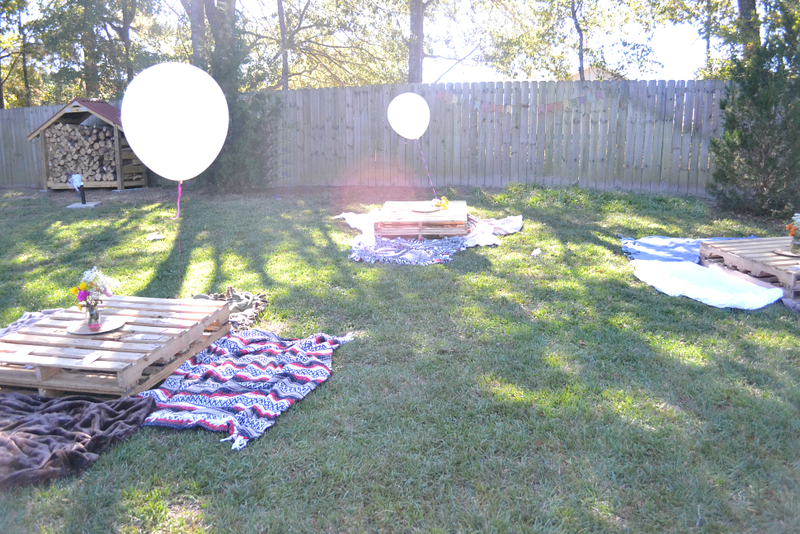 With the beautiful cool weather rolling in, I thought a fanciful backyard picnic was in order. When I came across an amazing faux grass backdrop on a wedding website, I immediately got chill bumps and was in awe of it's simple yet grandeur statement. 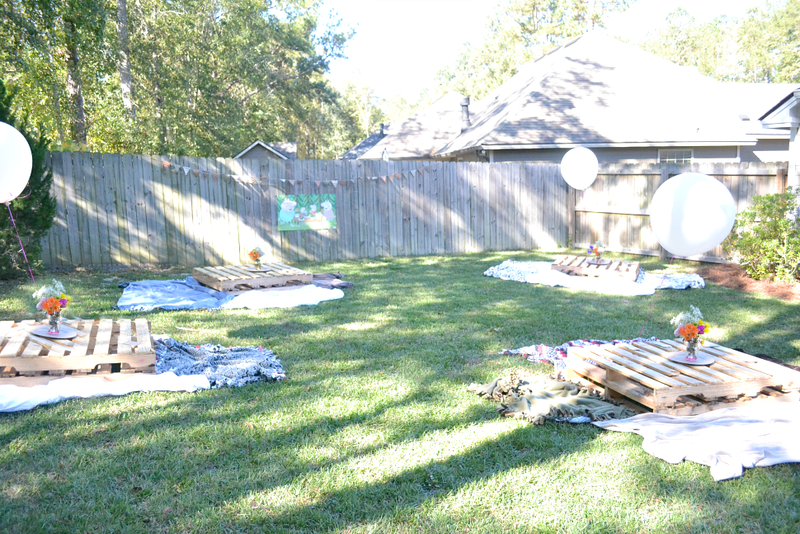 So I decided to incorporate something similar to McKenzie's party. You would be amazed at how real faux grass turf looks and the price is just as appealing! I purchased a 7.5ft x 4ft sheet of faux grass from here at Home Depot. I used a staple gun to attach it to a plywood sheet. 4ft X8ft. I then created the sign using picmonkey.com which I emailed to Office Max for enlargement. I cut the sign and adhered the sign to a foam board sheet that I picked up at Hobby Lobby so that it was sturdy enough to withstand the outside elements as it was pretty windy that day. I hung it up and it really gave the backdrop a sweet whimsy feel that Peppa Pig is all about. 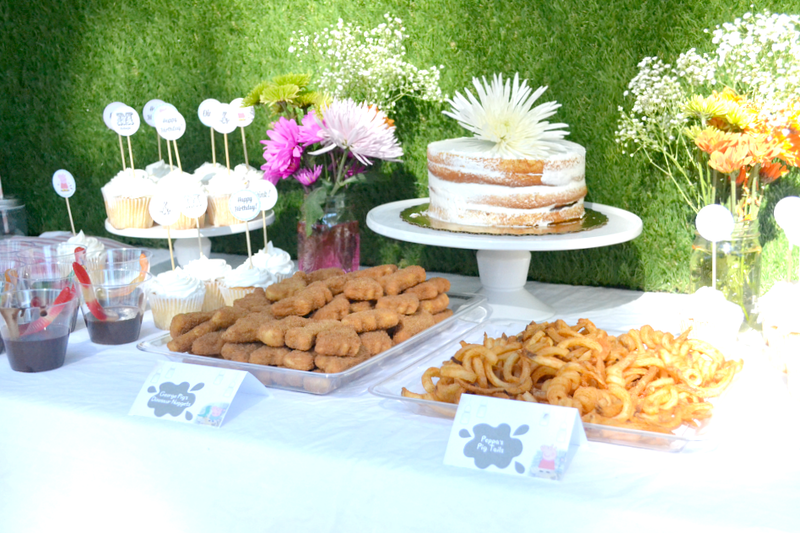 Of course all the food had to speak to Peppa Pig and all of her family's favorites! 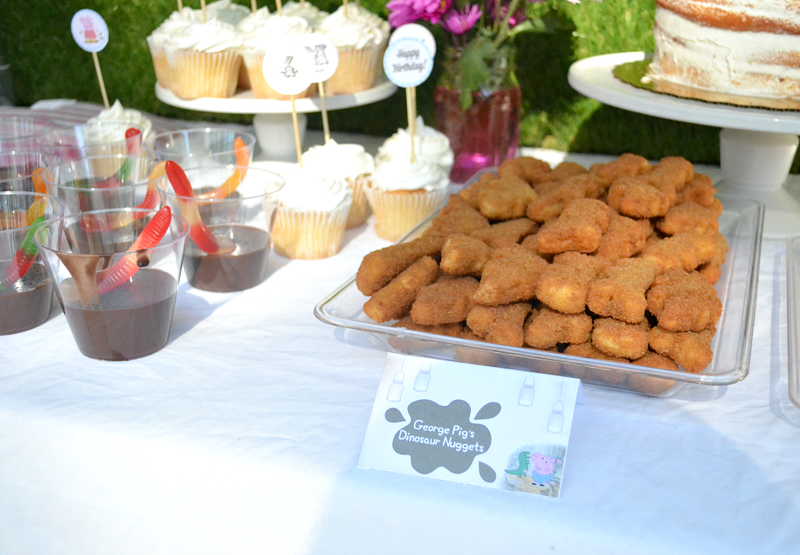 We had "George Pig's Dinosaur Nuggets" along with "Peppa's Pig Tails" Curly Fries. We had sweets-a-plenty! 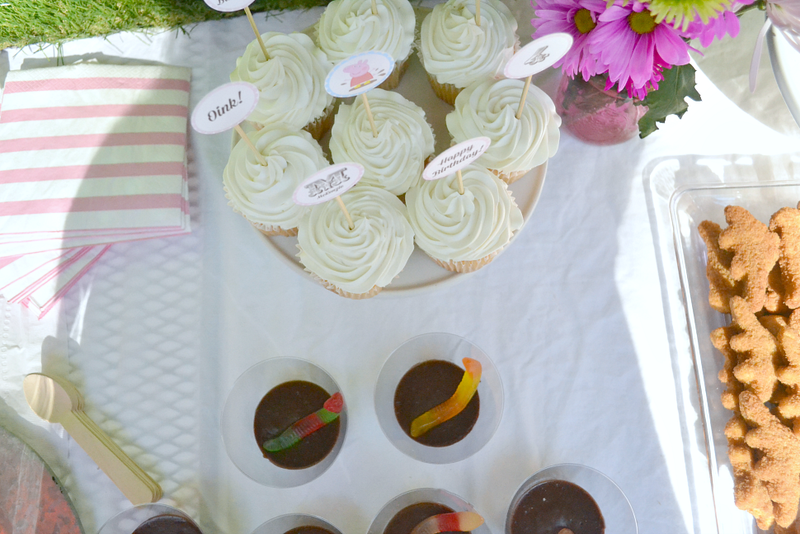 From cupcakes to birthday cake to "Mudd Puddle Pudding w/Wiggly Worms", guests had plenty of options to satisfy their sweet tooth that's for sure. 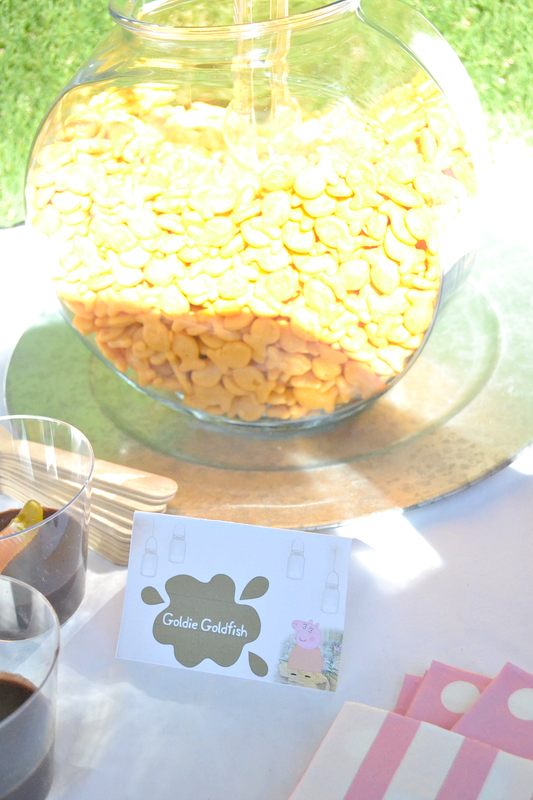 We couldn't forget about Goldie Goldfish. 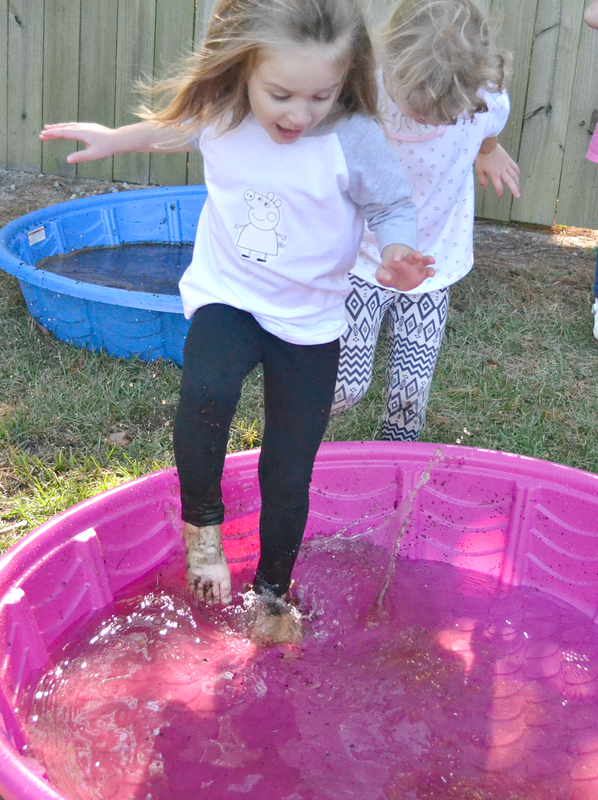 This fishbowl full of goldfish crackers made for the perfect snack while the kiddos played. 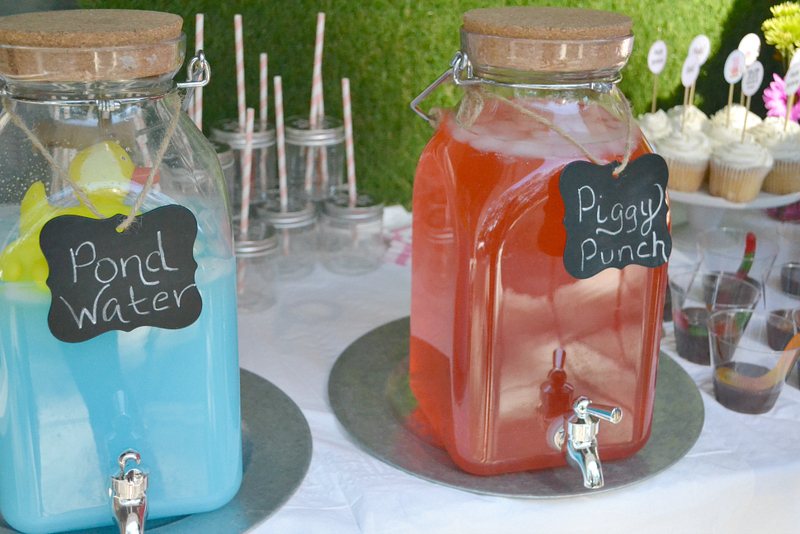 The refreshments included water bottles that I wrapped with a DIY printable, "Pond Water" (Blue Raspberry Punch) & "Piggy Punch" (Pink Lemonade)! 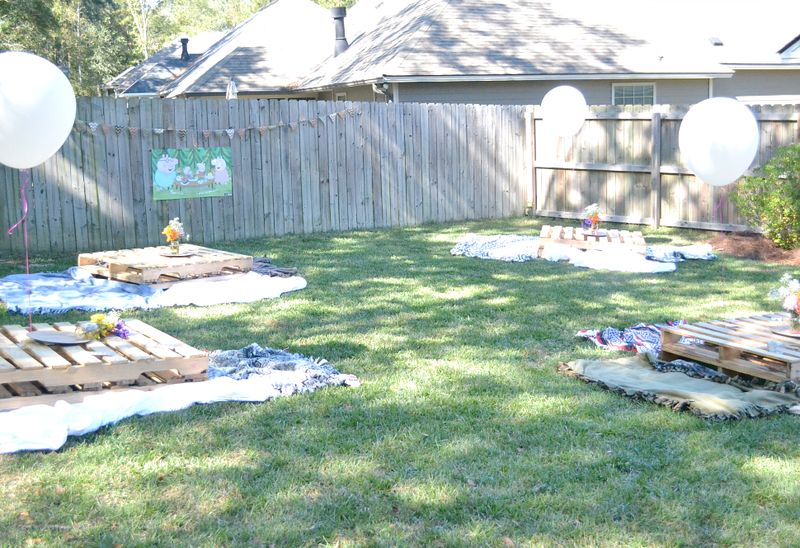 My favorite part was our make-shift picnic area for guests to enjoy their yummy snacks. 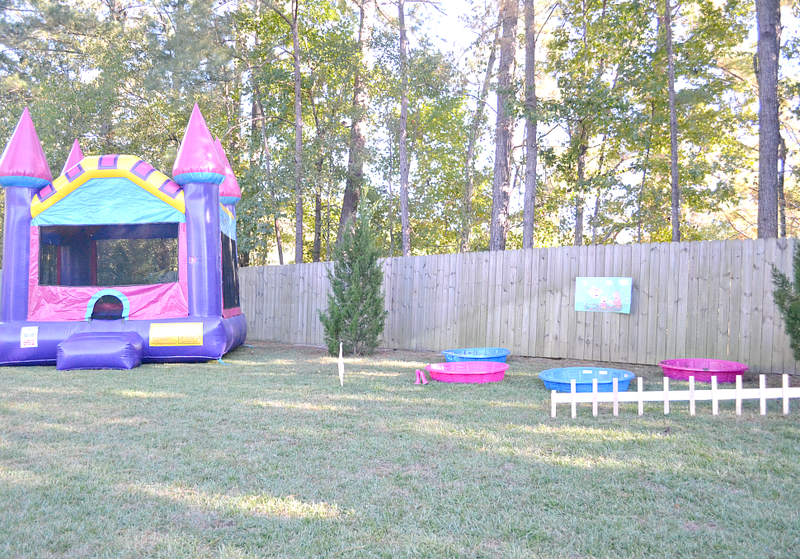 With kids, you know there is not much sitting, however it brought a fun and unique space to the party that you don't see that often. I simply stacked two well-sized pallets and surrounded them with random blankets we had around the house. We lived in Alaska for 4 years, so we had plenty and them some! 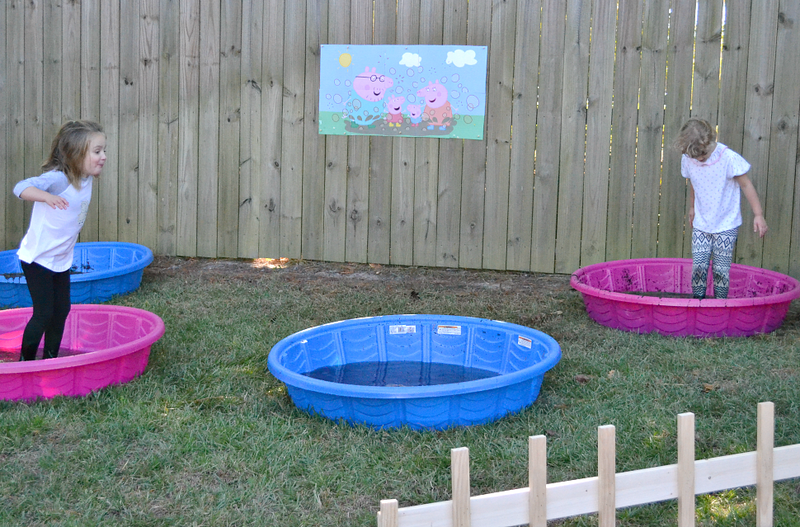 I printed out these adorable Peppa Pig Signs to Mark each area that we had laid out. 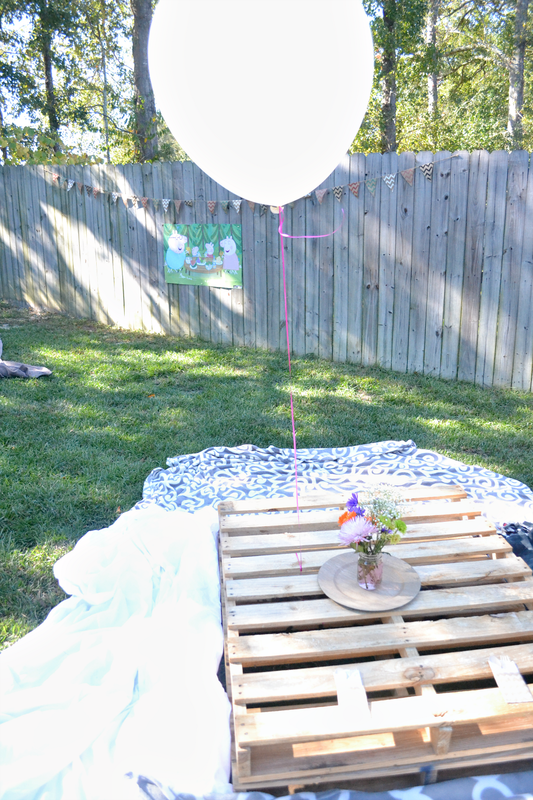 Since this was the "eating" area, I thought this sweet image of Peppa and her family picnicing at the park was perfect! I printed this image using Block Poster, it's a wonderful site that divides your image up into the exact number of pages you will need to create a poster. I printed the image using my printer and basically arranged each page as if it were a puzzle until the image was in place, then taped the back of the pages together, then taped the poster to an actual poster board sheet to give it a little more stability since I planned on hanging it outside. 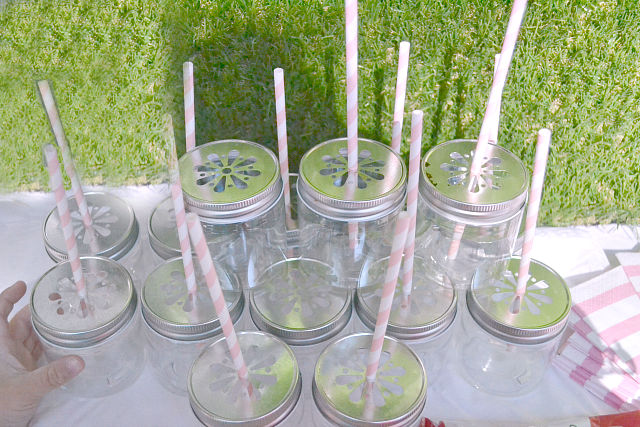 Of course a party wouldn't be complete without a Photo Booth! 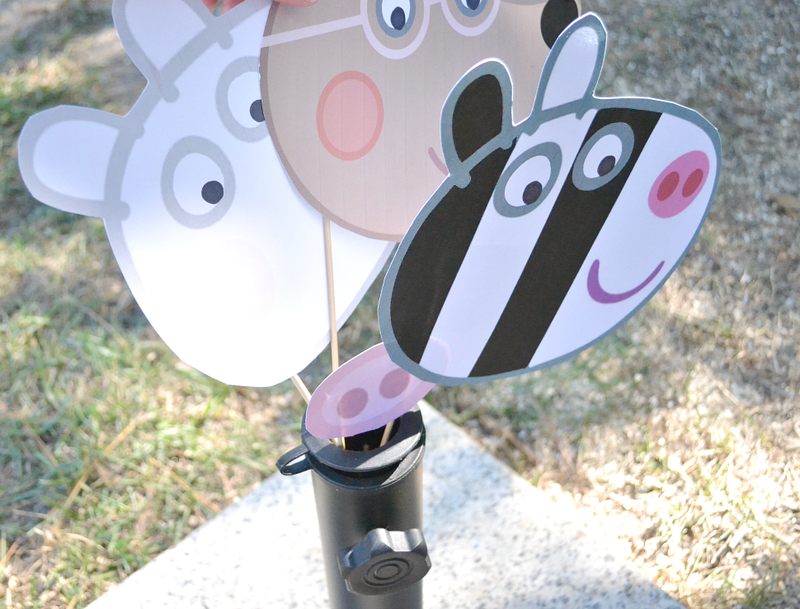 I purchased these adorable Photo Booth Printables from etsy shop: Ira JoJo Bowtique. 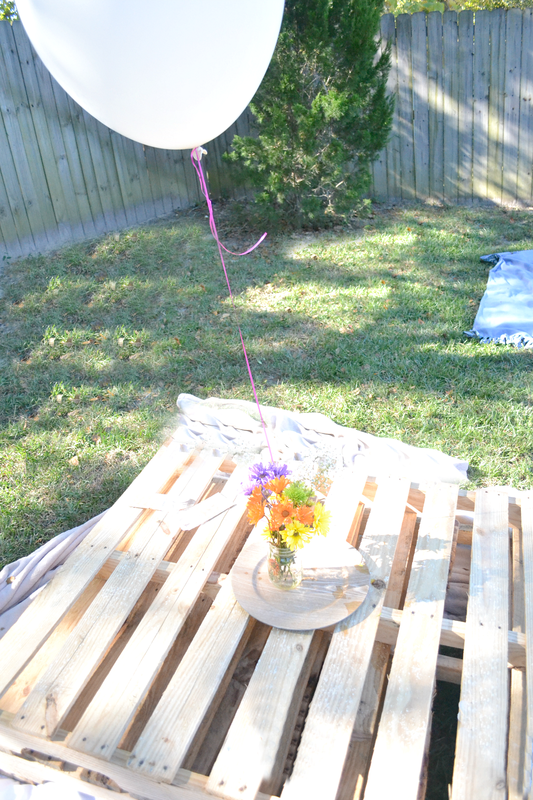 I cut them out and adhered them to wooden skewers. 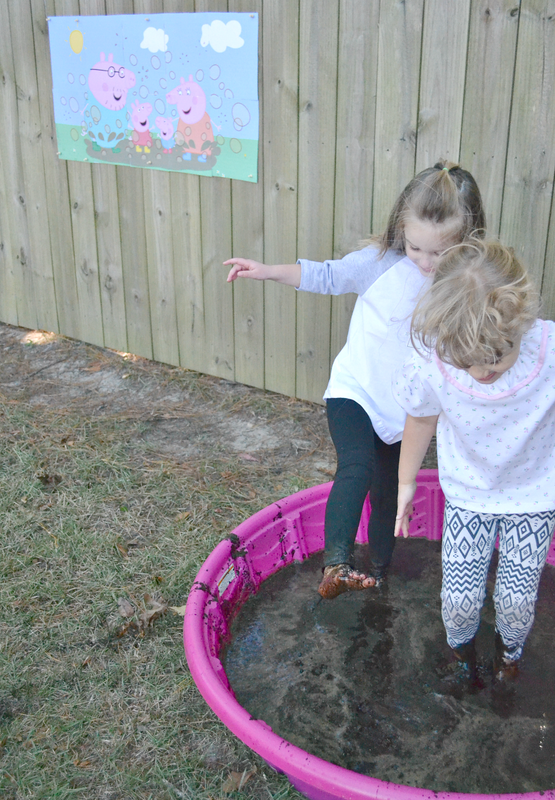 Peppa's favorite hobby is Jumping Up and Down in Muddy Puddles, so we HAD TO HAVE a Muddy Puddle Jumping area. I wasn't sure if parents would love it or run for the hills before their child noticed! 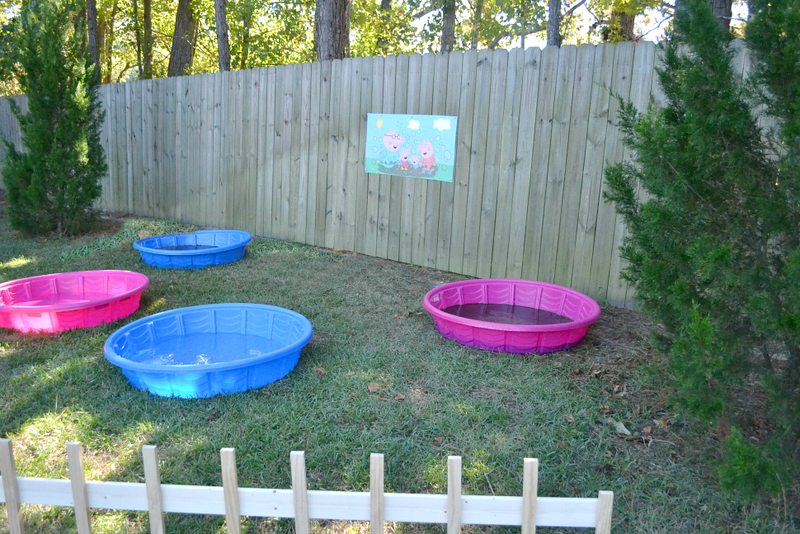 I purchased these baby pools at Walmart on Clearance as they were the perfect size for such an event! 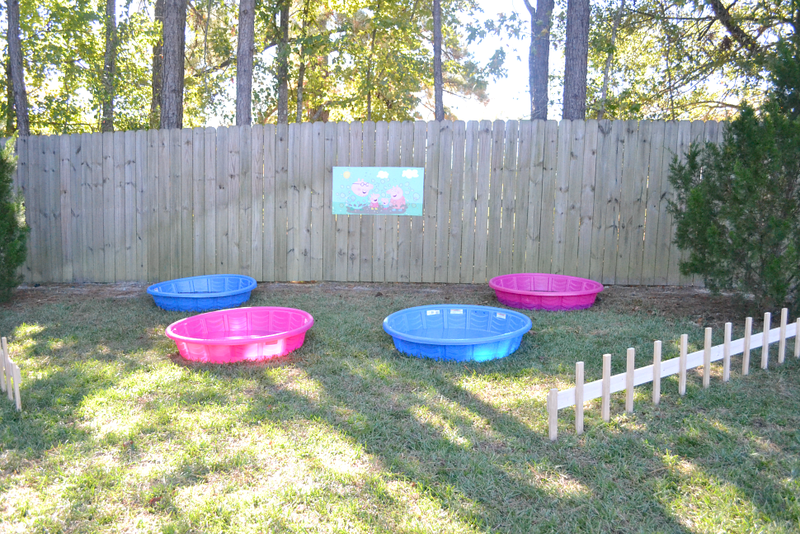 The back two pools were filled with muddy water, the front two were filled with water for "clean-up". 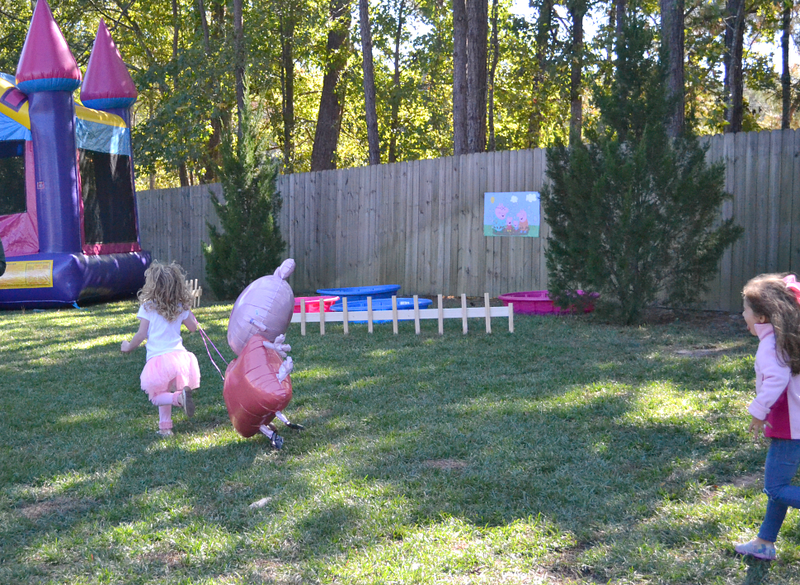 The BIG STAR of the show was this adorable Peppa Pig Balloon Walker!!! 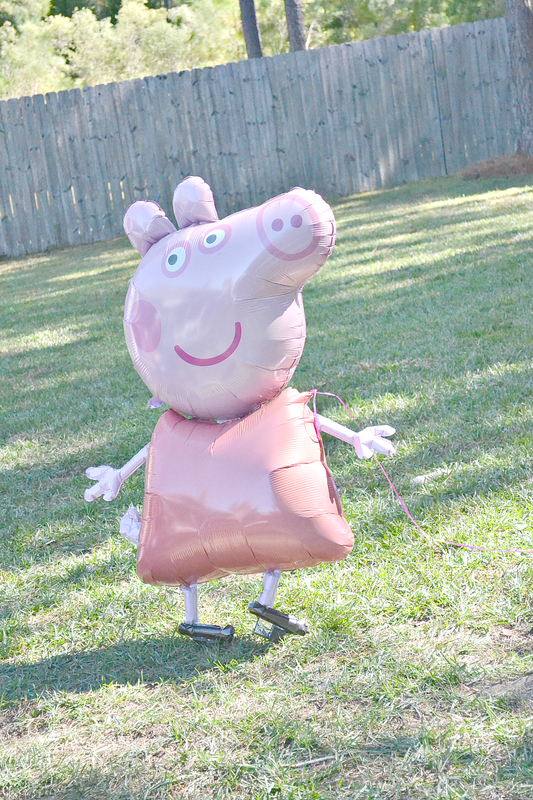 If you don't have time or $$ for a lot of birthday activities, purchase this balloon and your guests will be busy and entertained for the entire length of the party! I purchased this balloon last minute as a little surprise for McKenzie and the kiddos went wild!! 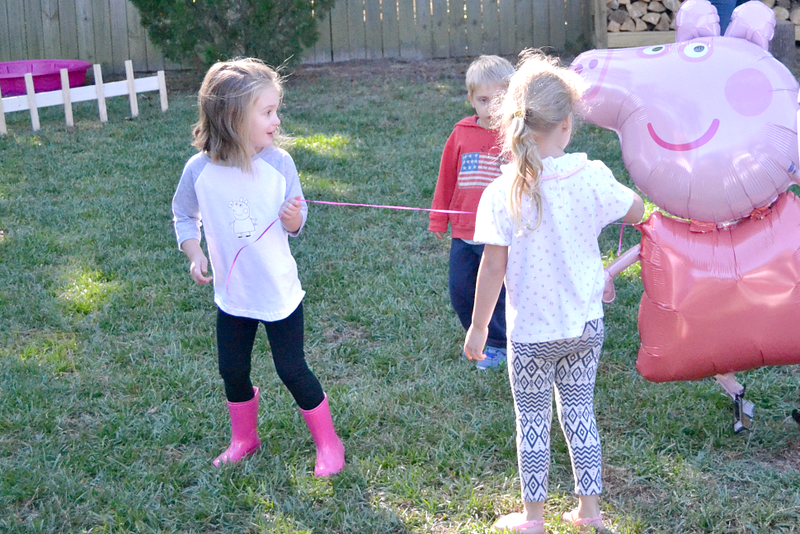 From pulling her to walk behind them to chasing Peppa across the yard, this Balloon was worth every penny at only $16! 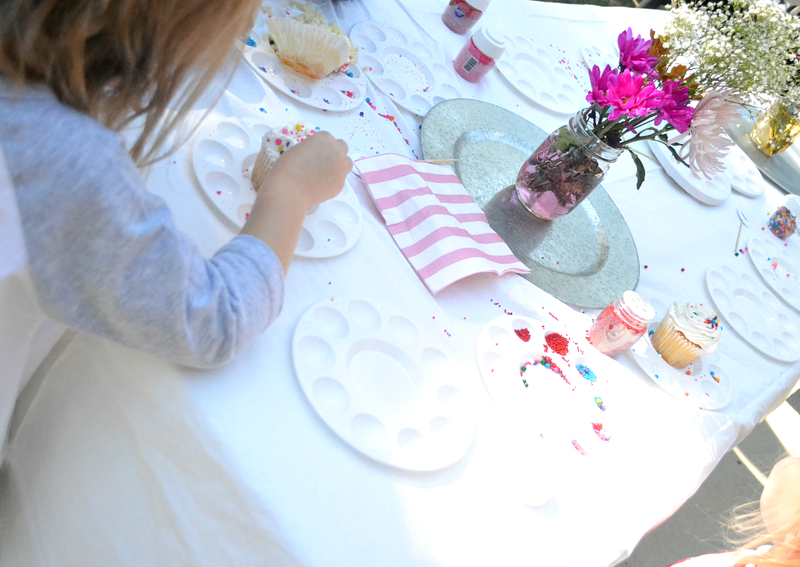 I had a little bit of extra room to set up a Cupcake Decorating Station which the kiddos appreciated. 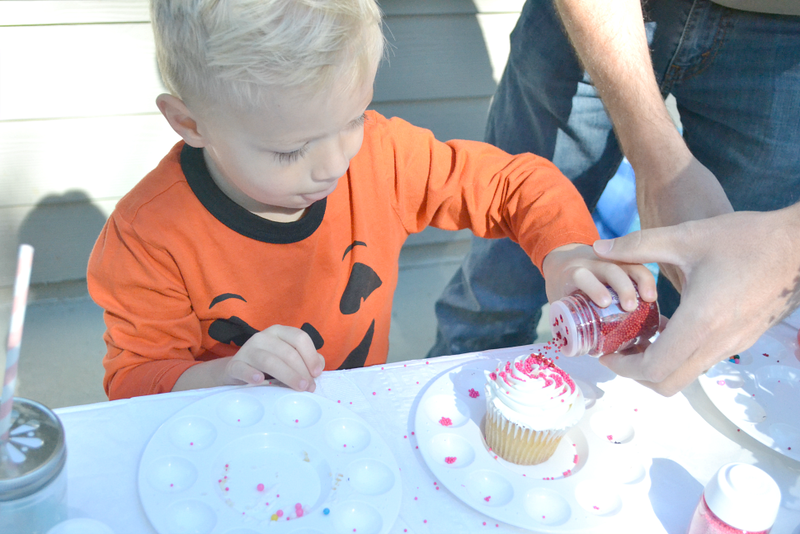 They were able to decorate their own cupcake in their favorite colors and sprinkles! 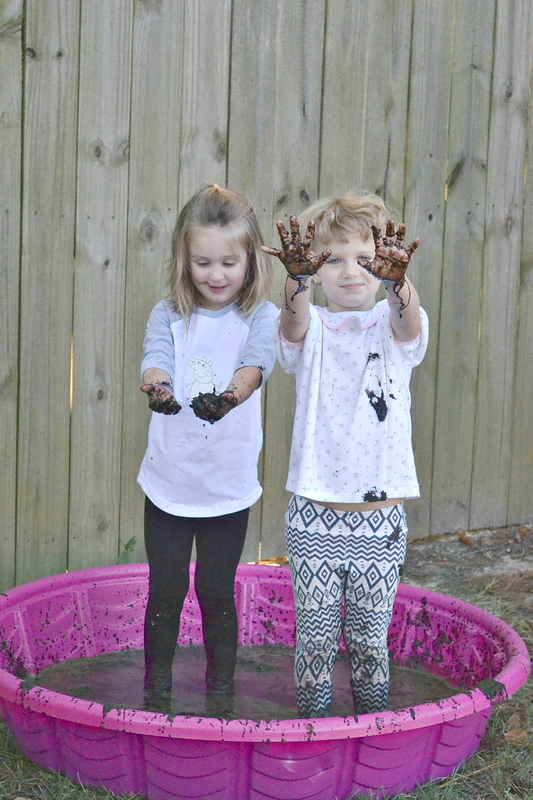 Another activity that doesn't break the bank and your little guests will LOVE! I just purchased plain vanilla cupcakes with Vanilla Butter Cream Frosting from Publix, easy peasy! At the end of the party the birthday girl and her friend Sophie couldn't help but jump right in! 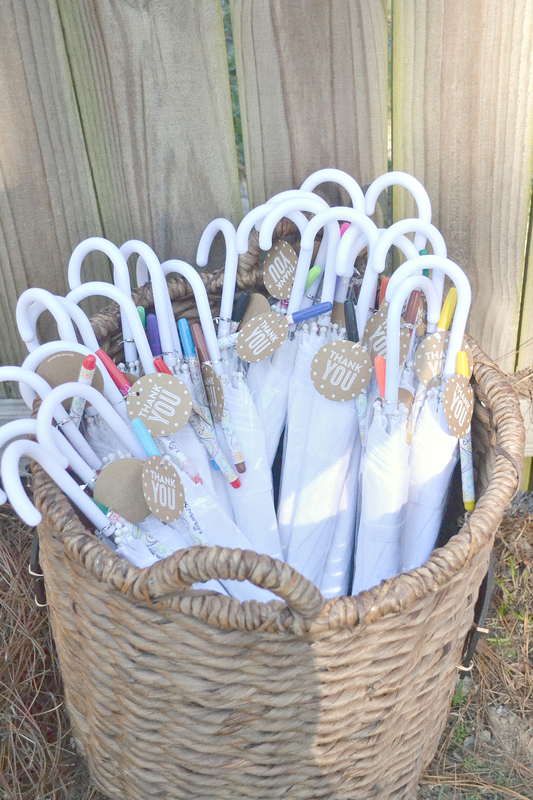 I found these sweet little DIY umbrellas at Oriental Trading at a very great price! 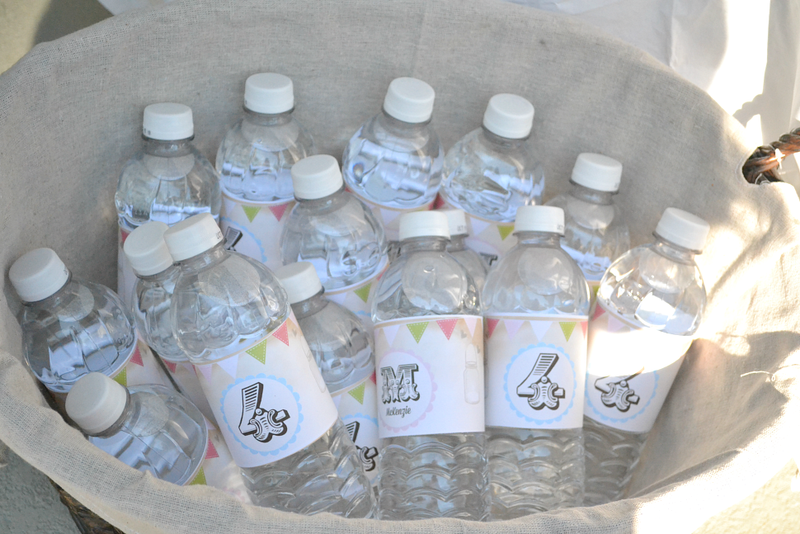 They made for perfect party favors!! 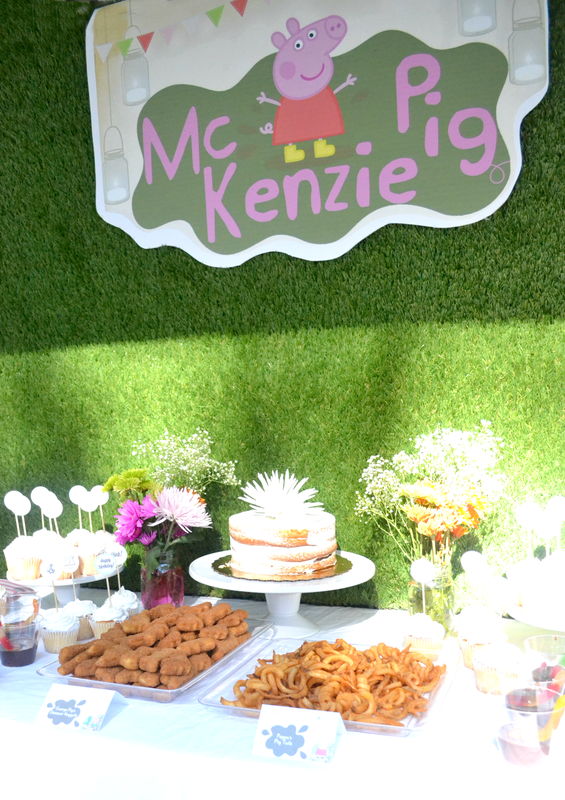 The party was a wonderful way to celebrate our little McKenzie and her favorite character as part of the fun! 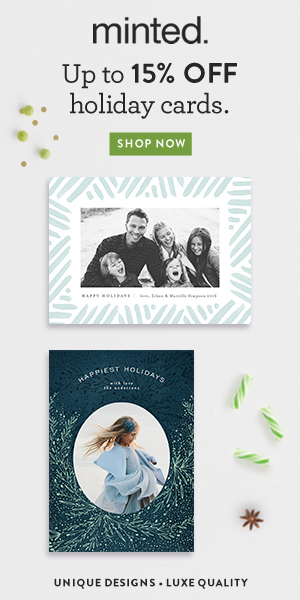 I wanted to have a little keepsake for McKenzie to have to look back on and found this amazing Company Pen Wizard that creates adorable personalized Peppa Pig books. I used McKenzie's book as a way for guests to sign as they walked in. It will be so special to look back at the names that helped make her party one to remember! 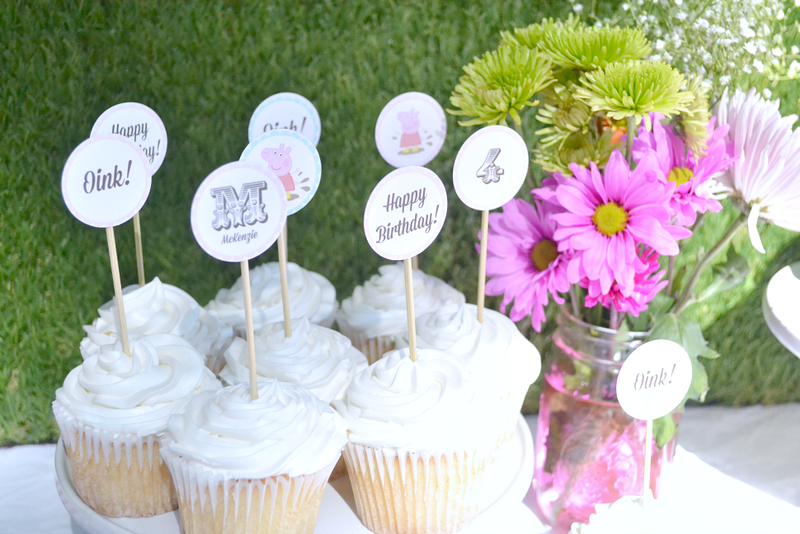 I hope you enjoyed our little Peppa Pig Backyard Picnic Celebrating our Baby Girl Turning 4! 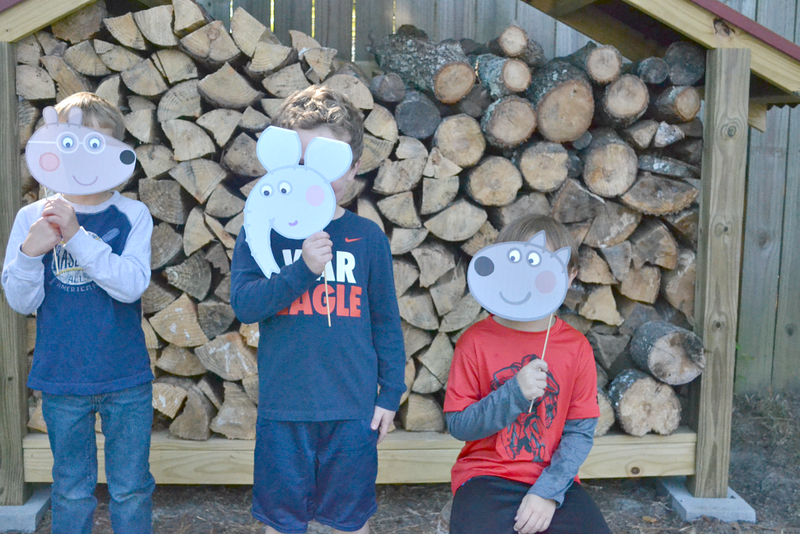 I would love to read how you dressed up your little one's character party! I have a feeling this will not be our last so I will definitely need inspiration for several years ahead! Leave comments below! Absolutely Amazing!! Ya gotta gift young lady!